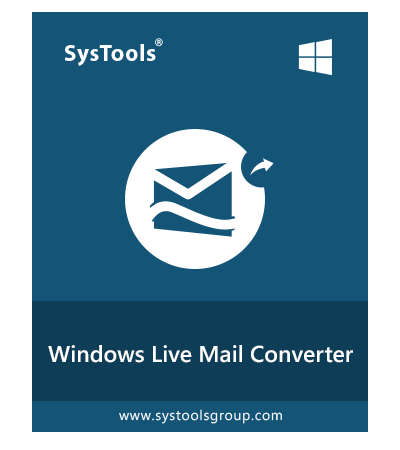 Download SysTools Windows Live Mail to PST Converter Wizard on your Windows OS Machine. Which enables you to Transfer emails, contacts and calendars from Windows Live Mail to Outlook 2016, 2013, 2010, 2007, 2003, & 2000 versions. The tool is capable enough to export Windows Live Mail storage folders to Outlook without any hassle. SysTools Windows Live Mail to Outlook Converter Software got the 4 stars rating from Cnet for its efficient working. Download software and convert emails. 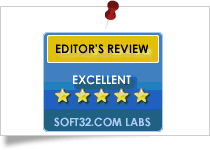 Soft32 provides SysTools Windows Live Mail to Outlook Migrator Software gets 5 star rating for being the most effective product for importing items of a WLM file. 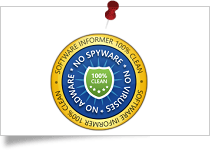 Software Informer gives SysTools Windows Live Mail to PST Converter Software 100% secure and clean award for its best performance. Being an IT Admin, I got a task to migrate 75 User’s mailbox from Windows live mail to Outlook. I tested many utilities, and found SysTools Windows Live Mail Converter is best. Because it maintains the inline images, hyper-links, font size, font style, email header, attached images qualities, email meta properties etc. In all the parameters, I have found this software best. Use this application, and export emails from Windows Live Mail to Outlook easily. I had saved my Windows live mail storage folder on my external storage device. Last night, I was in hurry to access old emails. But my new mail client Outlook did not support it. So, I searched for solution on Internet and found SysTools software. It helped me to transfer data from Windows live mail to Outlook 2013. Last month, I was searching reliable solution to import emails from Windows live mail to Microsoft Outlook. Luckily found, SysTools Windows live mail to PST converter. It made my task easy, after downloading and installing this tool. I browsed WLM mailbox and exported into .pst easily. I suggest you to try this tool for safe and secure conversion. 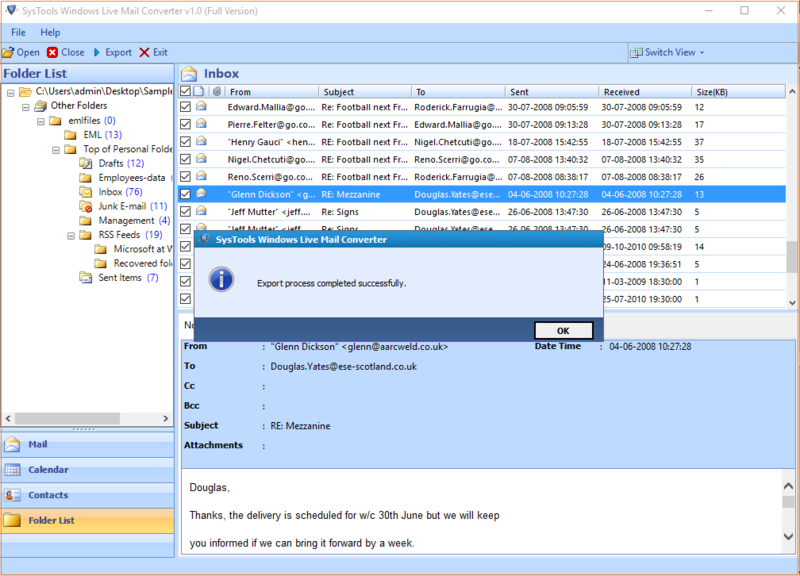 Import Emails from Windows Live Mail to Outlook 2019, 2016, 2013, 2010, 2007 etc. Migrating WLM files directly into Outlook is a critical task but still can be achieved with Windows Live Mail Converter. It allows to export multiple emails from Windows Live Mail to PST file format in bulk mode. Using this, one can export entire emails, attachments, contacts, and calendars from WLM to PST file format in a single attempt, and it saves a lot of time. Users can either export only selective or entire data items of Windows Live Mail in a couple of clicks even without any kind of data loss. While exporting Windows live mail storage folder to PST file the tool retains inline images that are added alongside the text in a line, as it is. It can export all the images added within the email body along with text. The tool is designed in such a manner that it can export all types of inline images, regardless of their formats like PNG, JPEG, and GIF. There will be no alterations in the image properties of the source email file after migration. Despite this, it has the capability to import Emails from Windows Live Mail to Microsoft Outlook without any manipulation in hyper-links. It means the links added in the message body remains intact after conversion. Windows Live Mail to Outlook PST Converter is an eminent utility to perform different mailbox conversion. It lets users export WLM mailboxes to PST and does not make any changes in the HTML formatting of source email. The software exports Windows live mail emails with maintaining all the email properties like Subject, Date, From, To, Cc, Bcc etc. Besides, there will be no changes in the original layout of email and all the bold, italicized, or underlined text will appear the same in the resultant file along with the integrated hyper links. Best tool to Export Windows Live Mail Storage Folders to Outlook 2016, 2013, 2010, 2207 etc. The tool is designed to migrate Windows Mail to Outlook PST file. Thus, the Software helps you to Transfer email from WLM Platform in few & simple steps. On selecting File or auto detecting Default store folder path, the software starts scan. The selected WLM folder / files are instantly scanned by software automatically. Utilize the auto detect feature of Windows Live Mail Converter Wizard if it is installed on PC. Select the radio button for “Auto Detect the Storage Location” and click Open, software will detect the default path of configured files. Moreover, you also can Convert Windows Live Mail to PST in a group or can apply conversion process on the entire WLM database including attached files. It automatically keeps up folder hierarchy as well as preserves email formatting. The software not only export Windows Live Mail to PST but also migrate address book from WLM to Outlook 2016, 2013, 2010, 2007 etc. Simply download and install this software on your Windows system and migrate complete data. For verification purpose, selected emails and attachments can be previewed with help of ‘Normal Mail View’ tab and ‘Attachments’ preview tab. But attachments cannot be directly saved as an individual file i.e. attachments can only be exported along with emails. Using WLM to PST conversion software you can arrange all the E-mails in ascending to descending order on the basis of properties like: To, From, Subject, Received Date and Size. This way you can get an immediate view of email list in desired order after adding file(s) to the software. Windows Live Mail converter comes with an applicable feature to into fractions by size. Choose the option to Split (2GB or 2GB above) into multiple parts and mention a common size in which you preferred saving divided parts of Outlook PST. This WLM to Outlook PST Tool gives naming convention option to save files as .MSG and .EML with desired pattern of naming. You can choose any of the featured option like; Date, Subject, From or AutoIncrement, etc in order of your choice to save files. 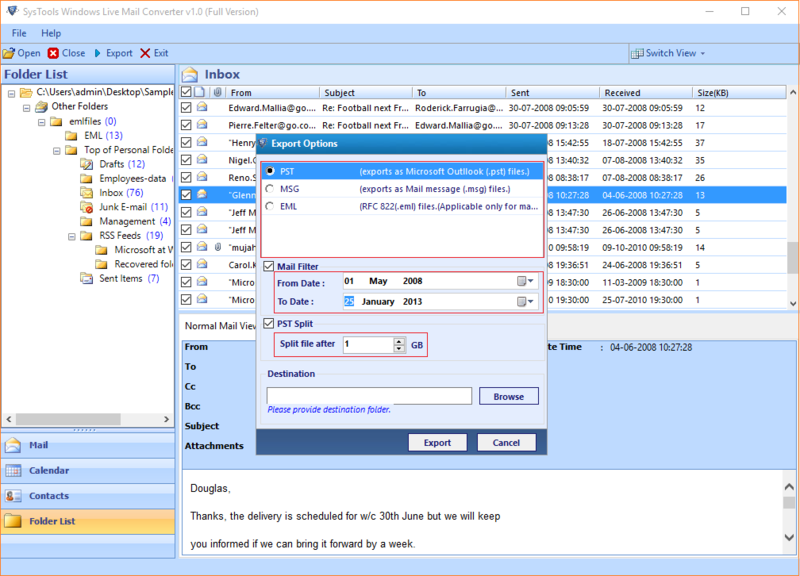 You can set a date range and filter a selective group of e-mails to be exported as PST, EML or MSG. This option will help you to convert and save emails of the specified date range for desired data conversion. Performing selective File(s) or Folder export saves time consumed while performing complete data export. Using check & uncheck select the desired items from: "Mail, Calendar, Contacts & Folder List" and export WLM to MSG / PST / EML format accordingly. Windows Live Mail to Outlook Converter gives two screen view patterns i.e. "Horizontal and Vertical". However, by default screen view is set as horizontal which can be switched to vertical view mode anytime as per requirement. 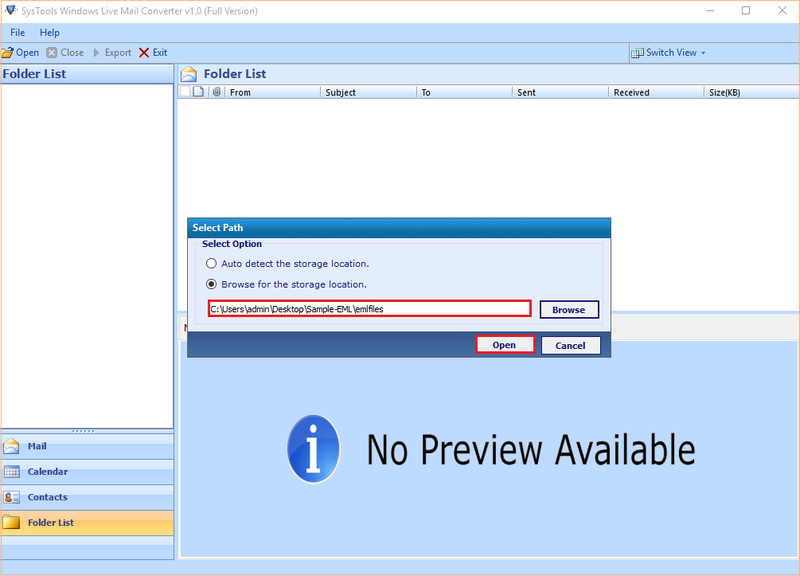 The FREE Demo version of Windows Live Mail to Outlook Converter Software will provide preview all WLM emails and Export 25 WLM Items per Folder to .msg / .eml / .pst format. Microsoft Outlook must be installed and must be configured properly for any valid or dummy profile/account. Your Question & Answer Here - How to Transfer Emails from Windows Live Mail to Outlook? 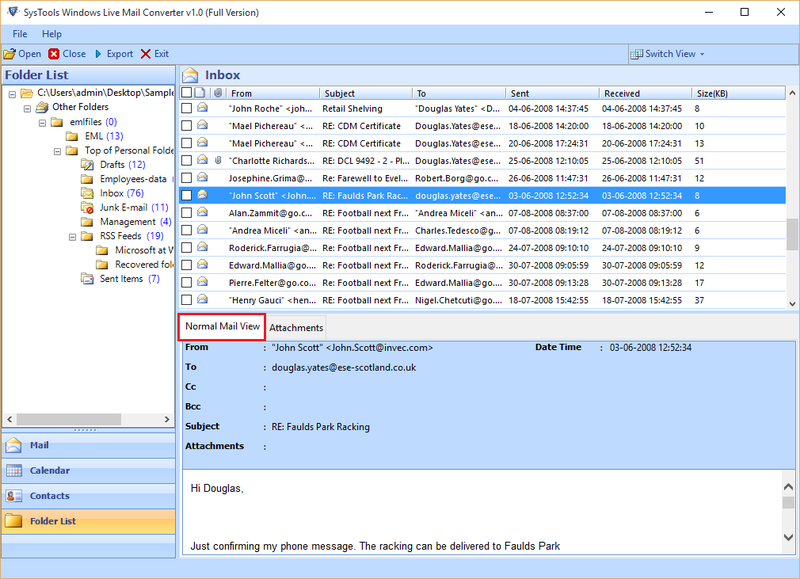 How to Convert Windows Live Mail to Outlook PST File Format? Will this Converter Software Work on Microsoft Windows 10? Can I convert single windows live mail email into PST and MSG format? Yes, you can select a particular email after scan and export windows live mail emails into Outlook. Also, the software converts WLM files into MSG and EML format. After performing the conversion you can easily migrate live mail storage folder to Outlook. Can I use multiple Identities to export Windows Live Mail to PST using this tool? 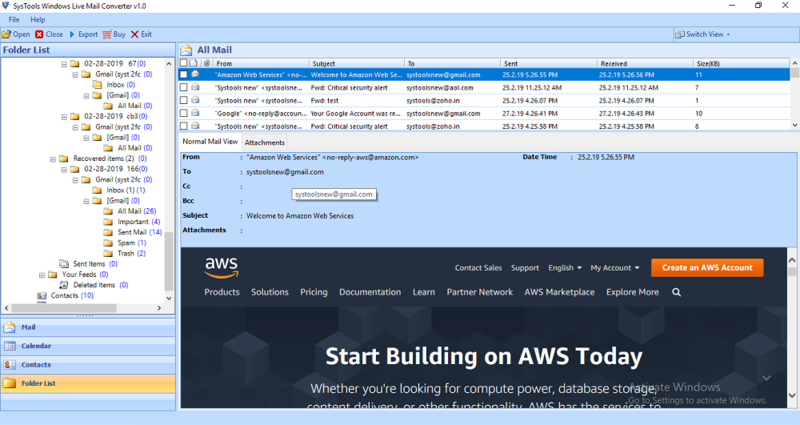 Yes, you need to add and scan the live mail store folder (Identities) one by one. After that you can select desired scanned folder using WLM to PST Converter Software and export complete mailbox at once. Does the tool migrate Windows live mail contacts to Outlook? Yes, software will export Windows Live contacts to Outlook PST, EML or MSG file formats including emails & calendars. Do I need to have Outlook installed on my machine before starting conversion process? Yes, to transfer WLM to Outlook PST format, Outlook installation & configuration is required. But if you want to convert Windows live mail data into EML or MSG formats, then there is no need of having Outlook on your system. I have windows live mail storage folder that do not belong to any of my mailbox. Can I convert them too into MSG format using your tool? Yes, the tool will let you browse a folder of files manually & export them using the software. Is Crack Version or Free Serial Key of Windows Live Mail Converter Wizard Available? No, SysTools does not provide crack version or free serial key Windows Live Mail to PST converter. If you are downloading crack version from any third party website then SysTools is not responsible for data loss. Windows Live mail to Outlook converter toolkit completely works for exporting WLM items. Using it, I have solved my conversion troublesome & convert my emails from WLM to PST format. Thank you very much guys for resolving my issue. Hello guys, your software has exported my all WLM data including attachments into MSG. After finding this incredible migration program my all WLM to Outlook conversion problems are far away. Thank you so much." I have been facing certain issues to migrate my data from windows live mail into Outlook environment. Thanks to this WLM to PST Converter Tool which helped me with bulk migration of data to Outlook. I have Google a lot but could not find any appropriate method for the same. 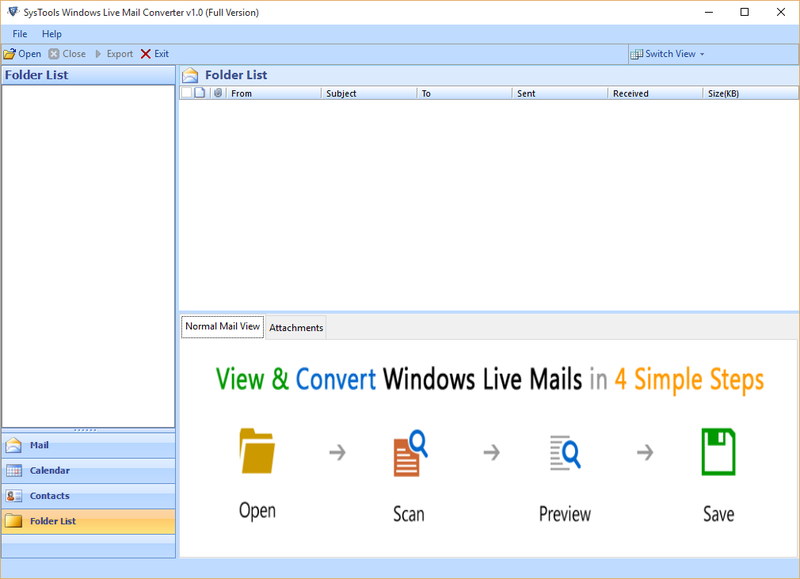 Finally, this Live Mail Converter Tool have been of great help for me to export data from Windows Live Mail to MSG file format. Few days back I was searching for how do I transfer my emails from windows live mail to outlook. After various search on Internet I found SysTools live mail converter software. Which helped me to export export windows live mail storage folders. The SysTools Windows Live Mail Converter Wizard worked well for me. It enabled me to import emails from Windows Live Mail to Outlook 2016 easily. I loved the working of the tool and support team helped me during exporting process. Know How to Change from Windows Live Mail to Outlook 2019, 2016, 2013, 2010, 2007 etc. Step 1: Launch Windows Live Mail to Outlook Converter on Windows System. Step 2: Preview Windows Live Mail File Data before exporting into PST format. Step 3: Export Windows Live Mail Emails to PST Files format easily. Step 4: Save Exported PST File Successfully at any location on system.